There was an era where the trust in the social space was strong and not to be doubt of, there is an era where all donation raised by a nonprofit or nongovernmental organization are being used for its primary purpose. There comes era where trust in the social space is feeble and something to doubt about, there comes an era where all donation raised by some nonprofit or nongovernmental organizations are not being used for the primary purpose. There comes an era and a solution that will revamp the trust and connect the dots between donors and organizations in the social space such as nonprofit organizations or ngos. There comes a mobile application, UYOLO! On the 9th of June 2018, our organization , Media For community change initiative became an official partner of UYOLO, An organization based in Milan, Italy that promotes philanthropy and volunteering. With their mobile app which was launched on the 15th June 2018, that serves as the first social media that has all the 17 SDGoals in one mobile application, they aim to connect the dots and establish a trustworthy relationship between NGOs, NPOs, CSOs and donors from different part of the world. The app is available on Google play store for android users and apple stores for iPhone Users. 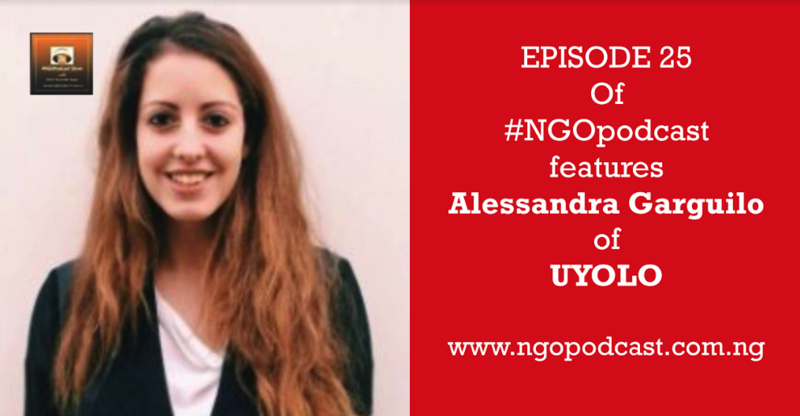 We had an exclusive interview with Alessandra Gargiulo one of the Co-founders of the organization during the launching of their mobile app in Milan, Italy, she told us more about their organization – Uyolo and lots more, Enjoy!